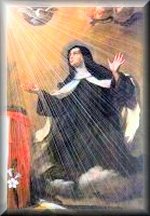 SACRED HEART WEEK 2016 (may2016e.htm) featured on The DailyCatholic, a Traditional Catholic publication dedicated to perpetuating the One True Faith and preserving the Traditional Latin Mass in this time of the Great Apostasy by upholding the sedevacantist syllogism in order to Save All Necessary Catholic Traditions in the United States (SANCTUS) and preserve the Truths and Traditions of the Church founded by Jesus Christ upon the Rock of Peter. This is a special week when we celebrate two glorious feasts. First on Tuesday, still within the Octave of Corpus Christi, we end the month of May by honoring the Coronation of the Blessed Virgin Mary as Queen of Heaven and earth with the Double of the Second Class Feast of the Queenship of Mary as we offer Our Lady a the full spiritual bouquet of beautiful flowers and virtues garnered for her each day during the month. 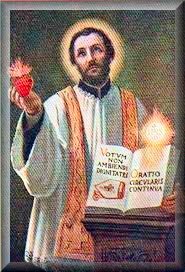 After we observe the Octave Day of Corpus Christi, we celebrate the First Class Feast of the Most Sacred Heart of Jesus on the First Friday of June, followed by First Saturday on the feast of the holy confessor St. Francis Caracciolo. For the full liturgy this week see immediately below. 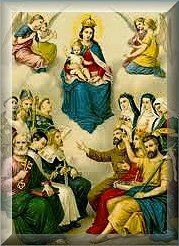 The day after Memorial Day, we turn all our attention on Tuesday towards the one honored throughout the month of May, the Mother of God whose coronation as Queen of Heaven and earth we celebrate on June 1 this year because of Trinity Sunday. 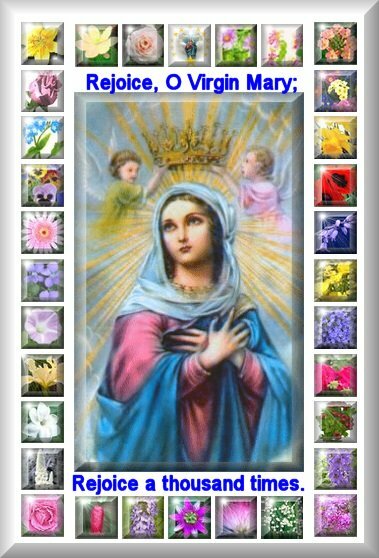 Appropriately throughout the past month we've honored her each day with a different daily flower that corresponded to a respective virtue in amassing a beautiful spiritual floral bouquet to be presented to Our Lady on her feast of the Queenship of Mary. 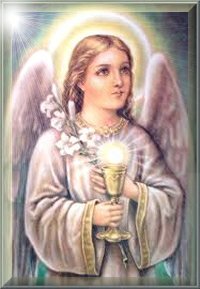 To enhance that spiritual bouquet we've prayed her devotion to The Little Crown of the Twelve Stars of the Blessed Virgin Mary. 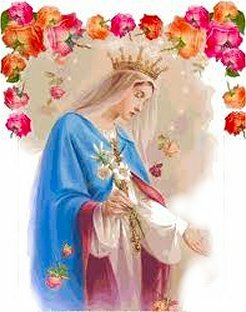 We present the full bouquet below for her feast day when we celebrate her Coronation. 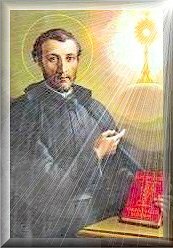 What we celebrate this week within the octave of Corpus Christi in celebrating the true Presence of the Body and Blood of Jesus Christ in the Most Blessed Sacrament of the Altar as we continue the Novena to the Sacred Heart leading to the First Class Feast of the Our Lord's Most Sacred Heart on Friday. 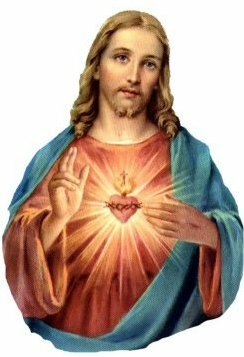 Committing ourselves to Christ comes full circle during this month dedicated to the Sacred Heart of Jesus leading to July which is the month of the Most Precious Blood. 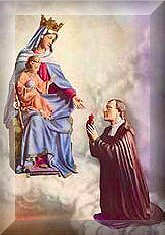 That is why we encourage you, if you have not done so, to seek out a true priest to come and enthrone and consecrate your home to His Sacred Heart. 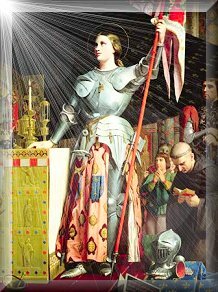 We refer you to our True Masses section for phone numbers of true priests throughout the United States for making an appointment for Consecration to and Enthronement of the Sacred Heart of Jesus in the Home. 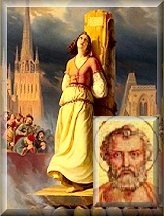 "Beware of false prophets, who come to you in the clothing of sheep, but inwardly they are ravening wolves. By their fruits you shall know them...Even so every good tree bringeth forth good fruit, and the evil tree bringeth forth evil fruit. A good tree cannot bring forth evil fruit, neither can an evil tree bring forth good fruit. Every tree that bringeth not forth good fruit, shall be cut down, and shall be cast into the fire. Wherefore by their fruits you shall know them." 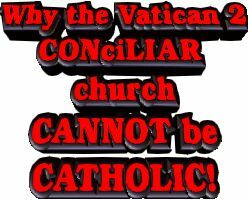 So we ask you, where are the good fruits of the CONciLIAR church of Vatican 2? Right! There are none! Do you want to cling to an evil tree that is destined for the furnace? 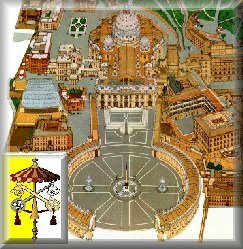 That is the destination of the Modernist church of Rome, described as the Harlot of Babylon in chapters 17 and 18 of the Book of the Apocalypse. We ask in all charity, please, please connect the dots. 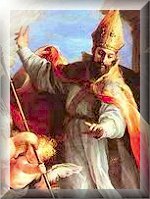 The rot of Vatican 2 has grown so out of control and perverted that today several do not understand what defines a heretic as heresies abound. Yet, those in the "Recognize-and-Resist" camps continue the ridiculous spin, tripping all over themselves, that Jorge Bergoglio is a true 'pope' while all the evidence belies that statement, especially in light of all the heresies attributed to him. Thus, we again present a two and a half minute video by Epichea Productions and first posted by Fr. Anthony Cekada on his Quidlibet to wake up the faithful to connect the dots on what constitutes a heretic. 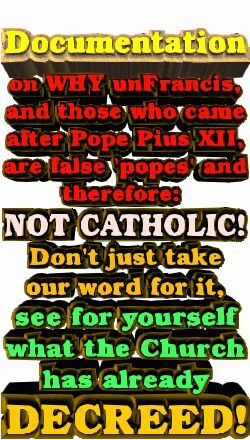 This shows clearly there is no room for doubt: The Vatican 2 'popes' have been heretics, ergo not true Roman Pontiffs. Flee the false church or forever rue it. This is why we highly recommend the following sources to keep all abreast of events as fast as they are spinning out of control along with their causes and consequences, as well as inspiration from other trusted ports, we confidently point you to NovusOrdoWatch.org and Christorchaos.com for articles and links, as well as four blogs worth your while, Introibo Ad Altare Dei, Bishop Donald Sanborn's In Veritate, Fr. Cekada's Quidlibet, and the satirical, but on-point Call Me Jorge and the longstanding Traditio to name just a few of the reliable sites you can trust. There are others, but most of these update almost daily. 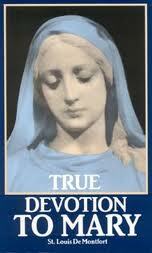 All we ask is that you pray for the grace to see the veracity of what is presented. It can be a tremendous task to leave the comfort zone of a religion that has relaxed so much, but isn't it worth it for your salvation? That was the decision we came to after realizing how much we were duped - yes, we're not alone - for as Jesus said in St. Matthew 24: 24-25: "insomuch as to deceive (if possible) even the elect. Behold I have told it to you, beforehand." We've been warned, and yet so many refuse to connect the dots. It behooves you to do so and do so soon. We strongly urge you to forego some TV tonight and devote a few hours to listen to the facts that leave no doubt. Click on the Tradcast graphic to the right to hearing what's really happening to our beloved faith. Knowing Marxist Mr. Jorge Bergoglio's track record we shouldn't be surprised that the world is thrilled with him and Amoris Laetitia, while many Catholics are shocked. 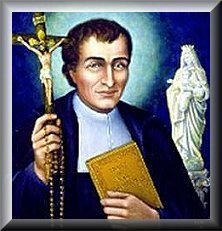 Traditional Catholics are not shocked because we saw it coming and predicted this very chaos. 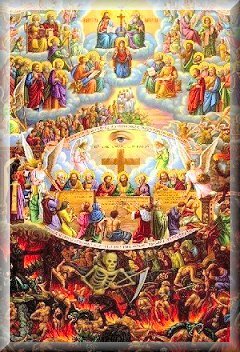 For all of this the best source for what is happening in separating the lambs on the right from the goats on the left is Novus Ordo Watch which provides links to several sources on reactions to "Joy of Love." 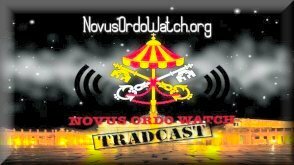 To affirm the above and assist you in this truth, we present a thorough talk by His Excellency Bishop Donald Sanborn, Rector of Most Holy Trinity Seminary, first published last week on Novus Ordo Watch. 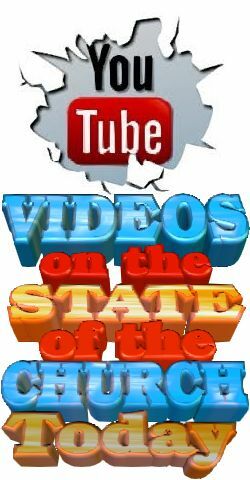 We encourage you to set aside an hour and a half to truly help your soul and clarify what is really happening by listening to his magnificent and eye-opening complete overview of the Great Apostasy in: The Novus Ordo Church, Vatican II, and Sedevacantism. It's a good idea to listen to the Questions and Answers after his talk that provides rock-solid reasons why Sedevacantists have been right all along and we pray more will receive the grace to see why and flee the Novus Ordo. All we ask is that you pray for the grace to see the veracity of what is presented. It can be a tremendous task to leave the comfort zone of a religion that has relaxed so much, but isn't it worth it for your salvation? That was the decision we came to after realizing how much we were duped - yes, we're not alone - for as Jesus said in St. Matthew 24: 24-25: "insomuch as to deceive (if possible) even the elect. Behold I have told it to you, beforehand." We've been warned, and yet so many refuse to connect the dots. It behooves you to do so and do so soon. 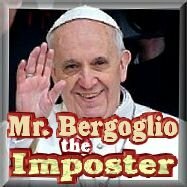 For further proof of the heresies of the false 'popes' who have ruled the "church of Darkness" for 57 years, we refer you to NovusOrdoWatch's links on Mr. Jorge Mario Bergoglio (aka Francis), Fr. Joseph Ratzinger (aka Benedict XVI), Bishop Karol Wojtyla (aka John Paul II) and Angelo Cardinal Roncalli (aka John XXIII). For why the latter's successors was not a true pope, see Archbishop Giovanni Montini (aka Paul VI) and his successor Monsignor Albino Luciani (aka John Paul I). If you cannot connect the dots after seeing the evidence, then there is no hope you ever will. If you want to take your chances with testing the fires with the bad tree, then, by all means, ignore what we have provided. But if you truly value the state of your soul, you will take this very seriously. 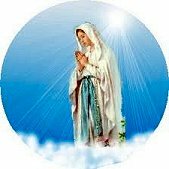 Remember, don't take our word for it, see what holy Mother Church has decreed and compare. 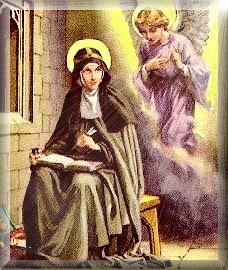 "Generosity will save a person from Eternal Death, it will even blot out any sin.....because Almsgiving is prayer...it brings graces, it cleanses the soul from guilt and punishment.....What good is faith without works, if we desert our fellow man in his need.?" If you have benefited in anyway from what we have published, we humbly ask your help to keep this publication on line. 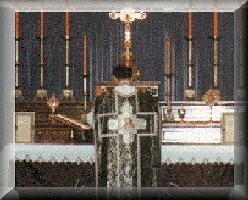 We know that so many of our readers are unable to assist at a true traditional Latin Mass because of where they live and use the daily liturgy we publish to gain the efficacious graces possible through their prayers at home. We remain the only publication in the world to provide such and are grateful to God that we can provide such nourishment for souls. We urgently ask if you can contribute anything in these tight times, we would be so appreciative for the coffers are truly bare. Think of all the untold millions being thrown into the election process this year. If you've contributed to a campaign, can't you spare a crumb for this apostolate to convert apostates? If you are still in the category of the lukewarm, then you will pass over this plea and move on to the next thing that tickles your fancy. But if you truly want to commit, we offer you the opportunity below to put that commitment into action for the good of saving souls. If you have not donated before, isn't it only right and proper to donate now? Whatever you can afford will be greatly appreciated. Just click the button below or send a check/money order to the address below. We are a bonafide non-profit 501c(3) religious association and all donations are tax-deductible. 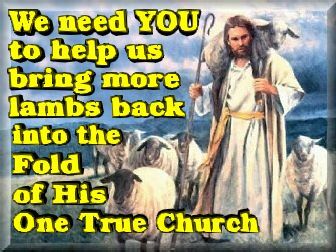 Whatever you would have contributed toward a bloated political campaigns or thrown away in the CONciLIAR collection plates that only goes to covering up the sins of its presbyters and false primates while destroying all semblence of Catholicism, why not earmark it for SANCTUS/DailyCatholic? 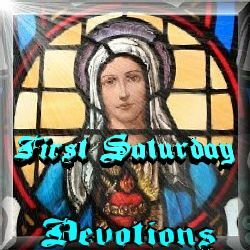 After all, shouldn't we all take St. Paul's strong counsel in 2 Thessalonians 2: 14 to heart and "stand firm, and hold the traditions which you have learned"? 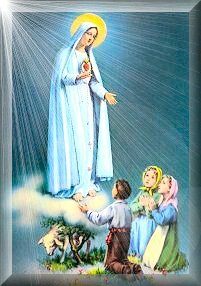 Each day we feature a title and/or salutation to Our Lady in celebration of Mary's month of May and today on the day after the Ascension and the day before her feast of the Coronation, we look to her, the living tabernacle of Our Lord for she is the one we turn to in order to gain a greater love for her Divine Son present Body and Blood, Soul and Divinity in the Holy Eucharist. 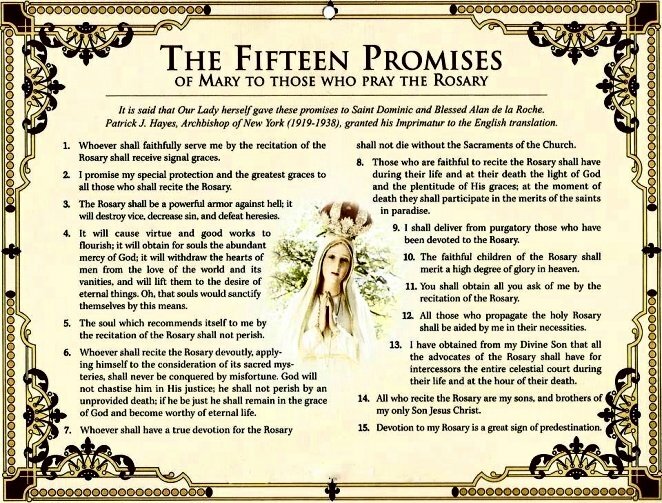 For true Catholics assisting at Holy Mass and worthily receiving Holy Communion is the greatest grace we can receive, followed by prayer, chief among the prayers is Mary's Holy Rosary while we also contemplate on the magnificent titles she is known by in the Litany of the Blessed Virgin Mary and The Fatima Prayers. 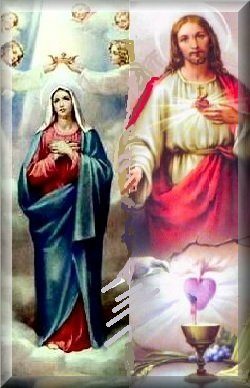 Today, the Solemnity of the Most Sacred Heart of Jesus, is so fittingly also the First Friday of June, with the devotions Our Lord imparted to St. Margaret Mary Alacoque. 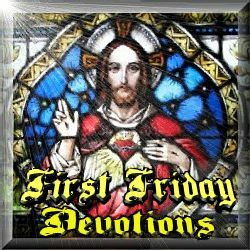 See First Friday Devotion.